These meatballs turned out really great, and satisfied my craving for the slow heat of ginger, balance of sweet and saltiness from a homemade teriyaki sauce, and the tender texture of ground chicken. I frequent a variety of supermarkets for different needs. My local Asian markets for most produce and some protein, Safeway and Whole Foods for organics, chicken, and seafood, and TJ’s for when I’m cooking just for myself. I love their small serving sizes. I have never really cooked with ground chicken before, but was delighted to find ground dark meat at my local Asian market, Sunset Super. A pound and a half was an alarming $3.49. I mean, you can’t really beat that. 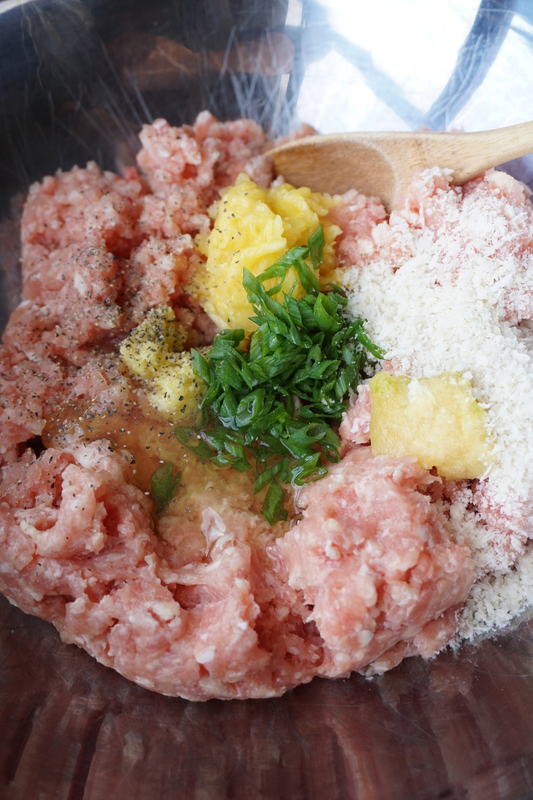 If your local butcher doesn’t have ground chicken readily available, feel free to ask the butcher to grind up 1 ½ lb of chicken breast for you. It’s actually best to always have a butcher grind your meat in front of you. I happened to use dark meat because it was available, but this works with ground chicken breast as well. - When purchasing ginger, make sure to select a piece that isn’t too crinkly and is firm and unblemished. I like to choose fairly straight pieces as they’re easier to work with. Peel away the skin with a paring knife or with a spoon. Mincing the ginger and garlic are important for the consistency of the meatballs, as well as being a great way to release the flavor of the ginger and garlic. - In a large bowl, combine the ground chicken, garlic, ginger, scallions, egg white, pineapple, panko, salt, and pepper. I used a wooden spoon to mix it all together. Once it was all incorporated, I added the soy sauce so that it could be evenly distributed. - You can dip your fingers in water to form the meatballs, but I found that my hands were freezing as I did this…not to mention a complete mess. The easiest way to form the meatballs was to use 2 spoons! Scoop up a ball of the mixture, and use the other spoon to help form it, transferring it to a parchment lined baking sheet. - Heat a drizzle of oil in a skillet on medium-high. As the oil begins to glisten, place your meatballs into the skillet, allowing them to brown and form a beautiful golden crust. As they brown, use a spoon to gently turn them so that they cook evenly. I also covered them for about 5 minutes while they were still cooking so that the insides of the meatballs could steam a bit and cook thru. My meatballs were about 1 ½" in diameter, and they took about 12-15 minutes to cook. It’s totally ok if they aren’t round! Mine weren’t at all, but it made them kind of fun and definitely homemade. Just try to stand them up on all sides to avoid burning, and so that they get a nice, even crust. - While the meatballs are browning, prepare the sauce. In a bowl, createa slurry by whisking the cornstarch and water together, slowly adding in the brown sugar, then the pineapple juice, garlic, ginger, and soy sauce. Add this to a saucepan over medium heat, and stir constantly until it thickens up, about 5 minutes. - Serve the meatballs with a ton of thinly sliced scallions and delicious sauce! These made my tummy happy - they’re hearty, flavorful, and fun for a weeknight meal with some noodles and greens. Try them tossed over a salad or they’re perfect for snacking on their own :) I hope you give em a try! If you do, tag me on Instagram @bac_blog and #brokeandcooking! :) Have a great week! !